On New Year’s Eve, Mr. Gregory Kirchhofer, chemistry teacher, headed for home after two weeks in Tennessee. The trip back took longer than expected but has given him stronger insight on what’s important in life. The journey from Knoxville, Tenn. to Columbia, Mo. involves four states and two time zones, a path of more than 600 miles. Advanced Placement and honors chemistry teacher Gregory Kirchhofer knows the route well. Kirchhofer left Knoxville at approximately 10 a.m. to get home by 8 or 9 p.m., before others’ New Year’s festivities were too far underway, he said, wary of the potential drunk drivers who might have been out that night. Back in Columbia, Mr. Kirchhofer’s youngest daughter, sixth grader Katie Kirchhofer, was at what she called “a hot tub party.” His eldest, University of Missouri-Columbia junior and 2010 RBHS alumna Bethany Ahlersmeyer, was out with her best friend to ring in 2013. RBHS sophomore Rachel Kirchhofer, his middle daughter, was more than 1,000 miles to the East, visiting a friend in New York City. On the road, there was “spitty, misty snow” from Knoxville to Nashville, Mr. Kirchhofer said, after which the weather settled into precipitation-free wind. As he neared home, Mr. Kirchhofer decided a final gas stop was necessary to travel the last 70 miles. In Warrenton, Mo., after about nine hours of driving, Mr. Kirchhofer filled his car with about 30 gallons. When he returned to Interstate-70, it started spitting ice, he said, and he took the car off cruise control. With 95 percent of his journey complete, Kirchhofer neared Kingdom City and started speaking on the phone with Ms. Lori Sebae, a friend whom he had visited in Tennessee. He was using a hands-free device, and his seat belt was buckled. He told Ms. Sebae to “hold on” as he passed a snowplow. The snowplow is the last of the memories Kirchhofer remembers clearly, but even it is not solid. He recalls the snowplow being “bluish purple with blue-green blades,” an illusion that marks the haziness of what would come next. Ms. Sebae, though, remembers the following moments well. The vehicle’s stillness harshly contrasted with the hum that had previously accompanied its purposeful 70 miles per hour. On her end, after the initial “hold on,” she heard bumping, followed by a crash, and then quiet, she later told Mr. Kirchhofer. In the extended silence, she figured that the line had disconnected and hung up. Over and over again, she tried to reach Mr. Kirchhofer’s cell phone. Twenty-one days later, Mr. Kirchhofer would hear the messages she had left on his voicemail, progressing from confusion to tearful panic. 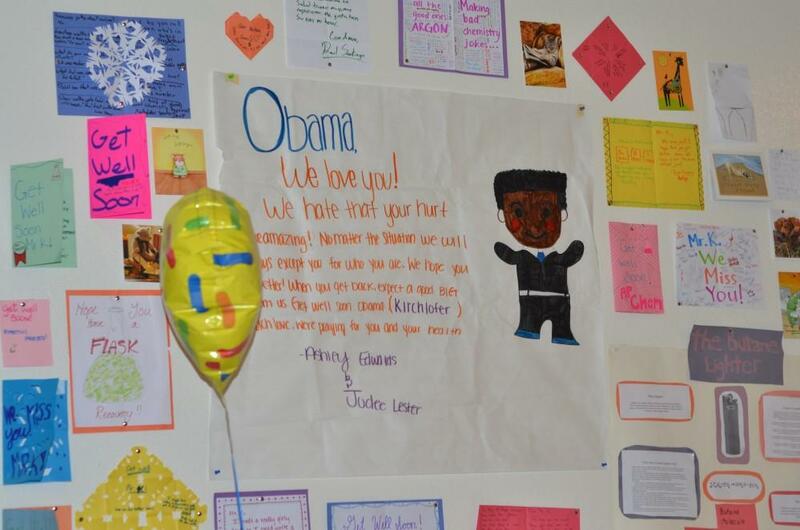 They were “rather difficult to listen to,” he said, even three weeks after the accident. She also sent text messages, requesting information and immediate contact from anyone who saw the phone; hours later a first responder saw the texts and gave her a call. She would get in her Jeep Cherokee 180 minutes after the accident, upon finally hearing what had happened and overnight make the same nearly-dozen-hour drive to Columbia. 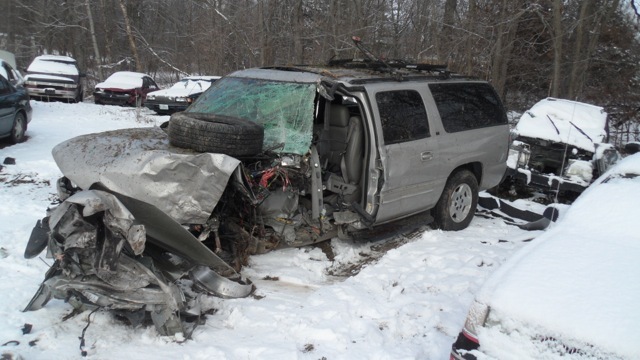 Back at the accident site itself, Mr. Kirchhofer’s next recollection is sitting in the 2006 Chevrolet Suburban, eyes flooded with bright lights and ears with blaring noises. The vehicle’s stillness harshly contrasted with the hum that had previously accompanied its purposeful 70 miles per hour. 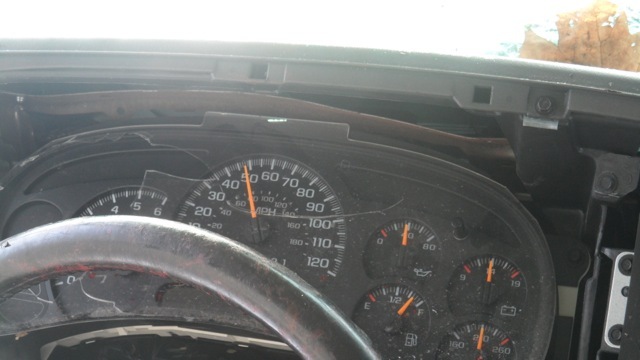 His head had hit something, but it had not gone forward to strike the steering wheel; instead, the entire dashboard had been crushed up to meet his face. The left side of the car had similarly collapsed into his left leg. He felt his other leg pinned against the seat, and as first responders cut off his door and cleared away metal to extract him, Mr. Kirchhofer told them he could move his right leg on his own. The semi-truck driver behind Mr. Kirchhofer had seen the Suburban drift toward the right shoulder, according to the crash report, but thought he would straighten back out. Instead, the driver saw Mr. Kirchhofer’s car go off the right side of the highway, down the embankment, across Old U.S. 40 and into the woods. The semi-truck driver pulled over, ran down and called for help, according to the witness report he gave the Highway Patrol. The crash site was tucked away from apparent sight, especially in the snowy dark, Highway Patrol trooper David Fouch said, and Mr. Kirchhofer’s headlights had gone out on impact. What had happened? The semi-truck driver asked him first, then the first responders. To each, Mr. Kirchhofer answered that he must have fallen asleep. Fouch remembers Mr. Kirchhofer reiterating the idea as his stretcher slipped into the ambulance. Mr. Kirchhofer could think of no better reason for the wreck, he later said. At the time, only sleep could explain the grogginess of his mind and the absence of his memory. Even in the confusion, Mr. Kirchhofer remembers being worried about Zeus, and this concern kept him conscious, giving him the strength to ask the first responders to make sure Zeus was OK and still alive, to call Beth, to keep Zeus safe until she could pick him up. “Don’t tell her how bad it is,” Mr. Kirchhofer requested. Assured by the first responders, he again lost consciousness. Next, he recalls being in the ambulance. Paramedics cut off his clothes, and Mr. Kirchhofer remembers lamenting over the loss of his “favorite green cords,” Ms. Sebae’s favorites, too. The green shirt he loved was also cut off. After inquiring about Zeus, he was relieved to hear that his Great Dane would be taken care of at the fire station, rather than at a dog pound or shelter, and Mr. Kirchhofer slipped back into sleep. But Bethany, like Ms. Sebae, remembers exactly what happened. She had forgotten her phone at the house, and when she went back to get it, she saw several missed calls from Mr. Kirchhofer and then several more from unknown numbers. The voicemails informed her that Mr. Kirchhofer had been in a car accident and that he was OK but needed her to pick Zeus up. Bethany, slightly annoyed with the disruption in her evening’s plans, retrieved Zeus, who had been lying with two firefighters at the Kingdom City Fire Station. Bethany returned the shaken dog to his home in Columbia and planned to swing by the hospital to pick Mr. Kirchhofer up. 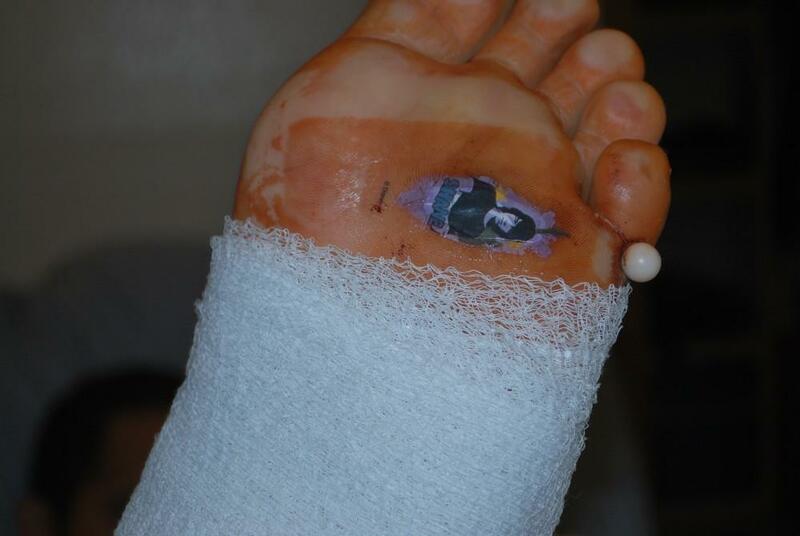 The Gregory that Bethany would find at University Hospital, though, had a few more stitches than she’d been expecting. Mr. Kirchhofer and Bethany have considered themselves father and daughter since she was in fourth grade. They met when she was in first grade because Bethany’s sister, Katelyn, was in Mr. Kirchhofer’s science class. It was Mr. Kirchhofer’s first year of teaching in Columbia, and his then-oldest daughter, four-year-old Shannon, had recently passed away. Bethany had been adopted by a single mom, so she had never had a father figure in her life. Three years later, when Bethany was in Mr. Kirchhofer’s class herself, she realized she could help fill both holes in their lives by asking if Mr. Kirchhofer would consider being her father and having her as his daughter. In July, Bethany turned 21 and celebrated that it had been nearly a decade and a half since they initially made this deal. Mr. Kirchhofer had told Bethany just a few hours before the accident that she should call him for a ride at the end of the night, when she was finished celebrating her first New Year’s past the legal drinking age, even if it meant waking him after the long drive. When she got to the hospital, Gregory apologized to Beth, as she held his hand, that he would no longer be able to pick her up. Three hours into 2013, chemistry and zoology teacher Susan Trice saw on the Missouri State Highway Patrol’s Online Crash Reports that a 44-year-old male “KIRCHHOFER, GREGORY L” had been in a serious car accident. Mrs. Trice sent her co-worker emails and texts, increasingly alarmed by the lack of response from a man who usually returned texts “really well.” Two hours later, at five in the morning, Mrs. Trice started calling the hospital, she said, inquiring about Gregory’s state and waiting for news. Bethany, after hearing from the nurses of the multiple requests for information, was the one who finally updated Mrs. Trice. Bethany Ahlersmeyer and Mrs. Trice, along with Mrs. Trice’s family, drove out toward Kingdom City to retrieve Mr. Kirchhofer’s belongings from the Suburban. Trice had yet to see Mr. Kirchhofer himself, so the impacts to the car were the first effects she saw of the accident. The first three days after the accident, Mr. Kirchhofer was in and out of surgeries, a period of time that was “kind of weird” because of the pain medications and because he was “floating back and forth” from clarity to unconsciousness. Because of his extensive injuries, when Mr. Kirchhofer was not in surgery, he was often in University Hosptial’s hyperbaric chamber. According to the University of Missouri-Columbia’s School of Medicine website, the dualplace hyperbaric chamber is called Perry Baromedical Sigma II. Hyperbaric oxygen therapy uses high concentrations of oxygen to “help the body heal a number of medical conditions.” Approximately the size of a hospital bed, the chamber at the University also features a “clear acrylic canopy” that allows patients to watch television. Because of damage and subsequent surgeries to his optic nerves, though, Mr. Kirchhofer’s eyes were sewn shut, so he could not watch television. Instead, his first time in the hyperbaric chamber was an experience so disorienting it could have come out of a television show. After one of his surgeries, Mr. Kirchhofer woke but didn’t have “any idea what was going on.” He faintly remembered the accident and surgery but could neither see nor feel his surroundings. When he finally saw a picture of the hyperbaric chamber, he realized how distorted his perceptions of the experience had been. To equalize pressure and protect his eardrums during his time in the hyperbaric chamber, Mr. Kirchhofer had tubes in his ears. 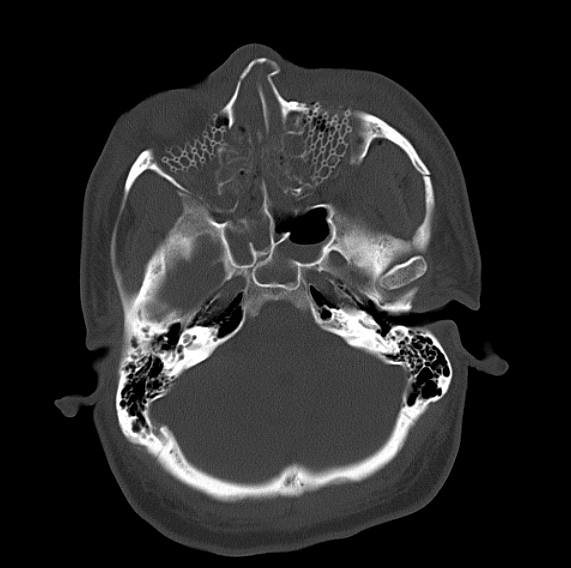 Blood clouded his eyes, even in MRIs. 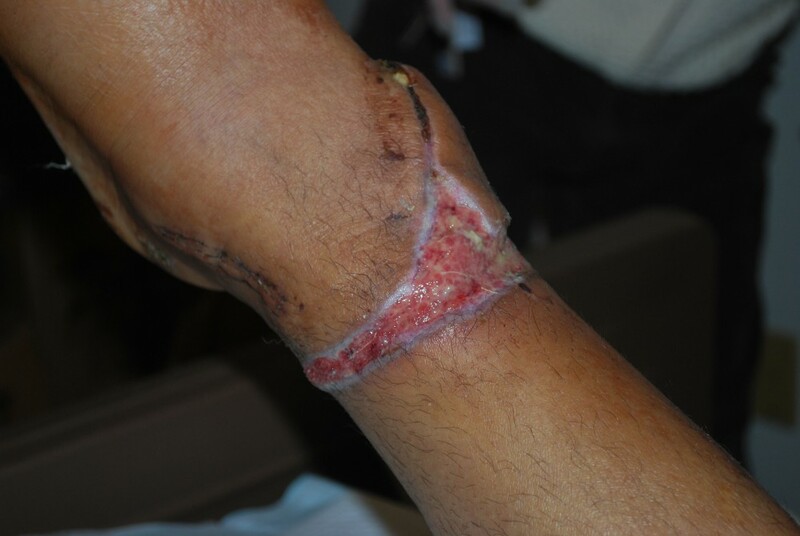 Tissue loss in his left foot meant a skin graft, harvested from his thigh, and a supal flap, a surgery that involved taking skin, muscle and arteries from the back of the leg to replace the lost tissue in his heel. Wires ran through his left hand and foot once those bones had been repaired, and an “external orthopedic fixation” held his leg together from the outside but also attached to the bones within. Internal nails still support both the fibula and tibia, and, he noted, he had a bruised rib. Initially, before surgeons had operated on the “demolished” bones of the face, Mr. Kirchhofer’s forehead, without any bone to support the skin, moved up and down with each breath. To fix that bone and allow it to heal, surgeons placed in his forehead a titanium mesh, which will stay there, integrated with the bone. Once the work on the bones was complete, the doctors stretched his skin and stitched it back together on his hairline, so that his hair will grow to cover the scars. While Mr. Kirchhofer lay unsure of his surroundings, his daughters could see their father’s injuries clearly. Katie thought back to the previous night and found it strange to think about what she had been doing when her dad was in the crash — she was “probably in the hot tub or playing in the snow … or something stupid,” she said. Her father being in an accident was so remote a possibility that Katie thought she must be in trouble when her mother picked her up from the sleepover early. But she wasn’t in trouble — her dad was, and she was going to visit him in the hospital. Rachel, though, could not see her dad once she found out about the accident. Stuck in New York for another two days after the accident, she faced the shock without her family, She did get to speak to her father, she said, though Mr. Kirchhofer “kept dropping” the phone. Rachel said her dad is “just such a good driver” that a car accident had never been something she feared. Even when she was back in Columbia, she had to wait to see her dad because he was in surgery the night she got back. Finally, three days after the accident and the morning after she herself had come back, Rachel got to see her dad for five minutes before he went to the hyperbaric chamber. Like Mrs. Trice, Rachel discovered Mr. Kirchhofer’s voice had not sounded as broken as his face looked. In person, Mr. Kirchhofer was extremely swollen. 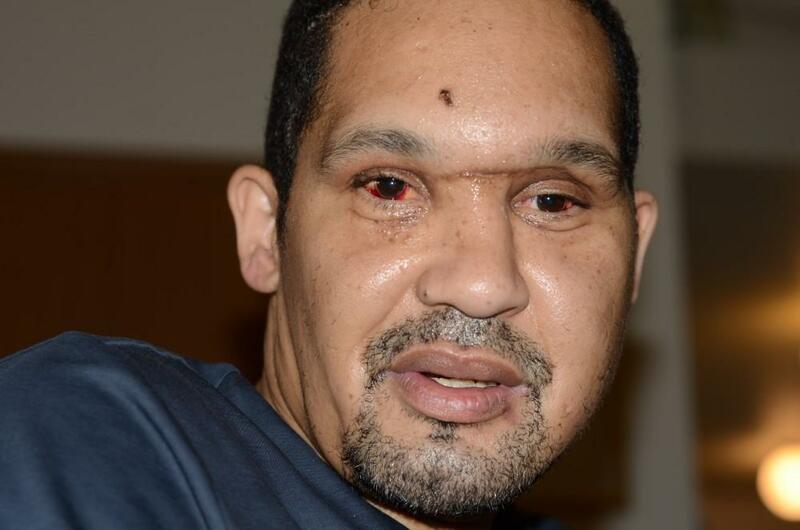 Threads prevented his eyes from opening, and his head was wrapped in a net like “one of those things they put on the oranges at the supermarket so that they don’t bump into each other,” Rachel said. Halfway across the country, the injuries from the car accident had been abstract and open to possibility; in person, their seriousness was undeniable. Even worse, having finally seen her dad, Rachel couldn’t stay with him. Mr. Kirchhofer was at University Hospital for a week, and the whole time the magic of the scientific process amazed him, he said. One of his surgeries has been common practice for just two years, his plastic surgeon told him, and this reminded Mr. Kirchhofer of how much “science rules,” especially the curiosity of researchers and doctors, as well as their ability to test, fix, refine and share their findings. Even more remarkable, Mr. Kirchhofer said, was the “level of genuine human connection and caring” he felt from the staff at the hospital and, later, the rehabilitation center, especially because he was blind for five of the seven days in the hospital. One of his doctors had an interesting accent, Mr. Kirchhofer said, which he found out was Hawaiin; the two talked about the ocean and sailing — Mr. Kirchhofer has a sailboat — and the conversation was a “nice little escape,” one that the doctor certainly had no obligation to provide. Mr. Kirchhofer could easily imagine a gifted surgeon who was little interested in actually talking to patients, he said, but the all the professionals who worked with him, from his doctors and nurses to the people who cleaned his room and brought him dinners, were always willing to talk to him and provide answers. Some of the titanium mesh in the forehead is shown here, but the same material was used to rebuild the cheeks. To repair the bones of Mr. Kirchhofer’s face, plastic surgeons peeled back his skin. When their work was complete, they stitched the skin back on, from ear to ear. The stitches above the forehead were made along the hairline to prevent visible scarring. The stitches along the side of his head, though, were reinforced by staples on either side. This image shows the staples on both sides overlapping as if on one side, but the row on the bottom is from the left side of his head and the row on top from his right. Mr. Kirchhofer’s upper jaw was shattered and needed to be completely reconstructed, which means he has to stay on an all-liquid diet. This extensive work isn’t apparent from his outward appearance, though the gap in his teeth is. 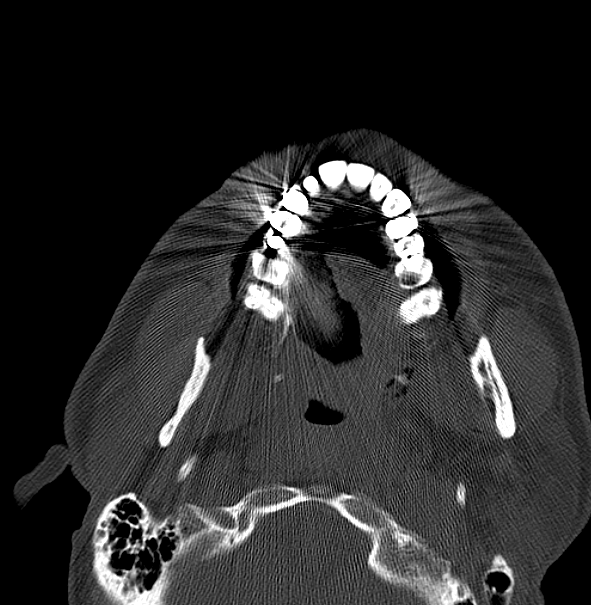 The missing crown is obvious in this x-ray. This x-ray shows the lower leg in its entirety, specifically the tibia and upper fibula breaks. The upper fibula break is more clear in the second frame. 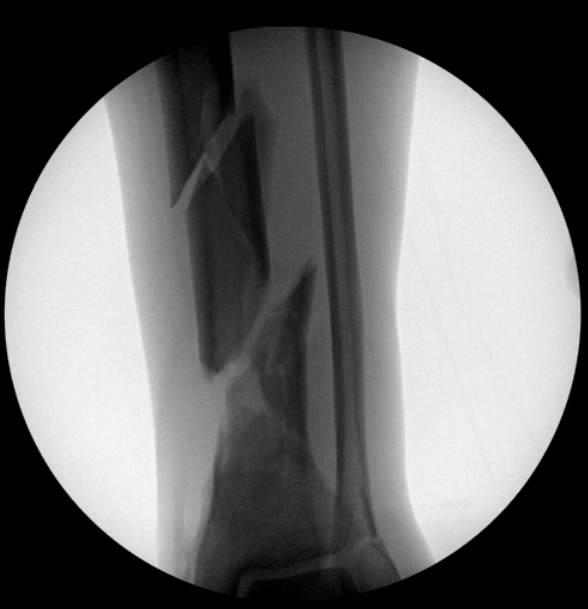 Mr. Kirchhofer’s lower fibula was also fractured but is not clear in either image. 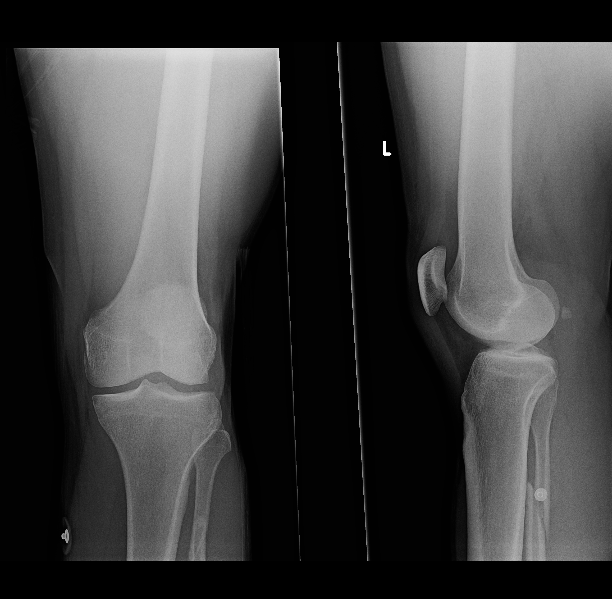 These two x-ray frames show a front view (in the left frame) and a side view (in the right frame) of the left knee. 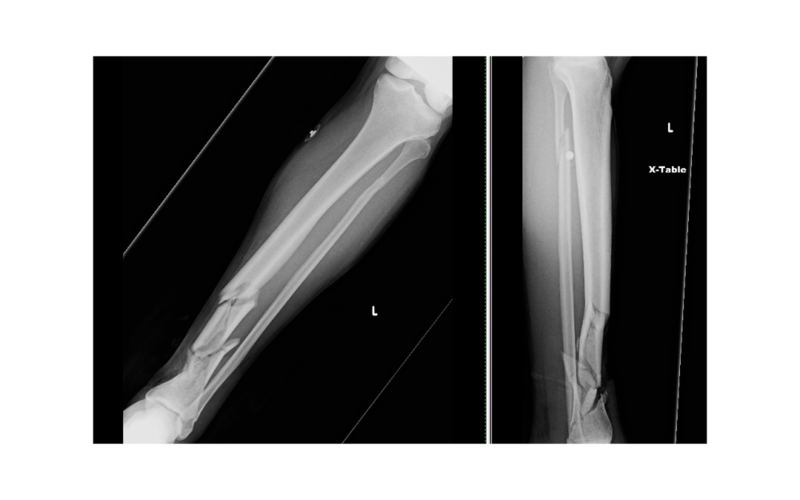 In the right frame, the upper fibula fracture can be clearly seen. 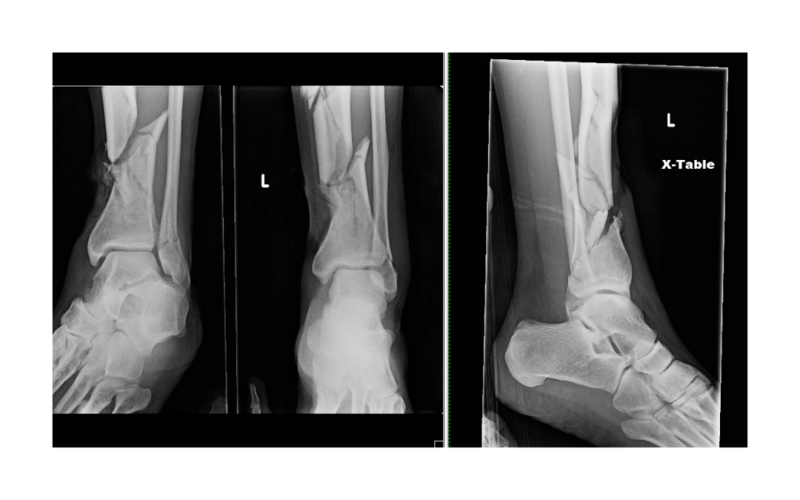 Post-accident, pre-treatment x-rays of the left leg, showing the lowermost breaks in the tibia (bigger bone, shown on the left in the first two frames and in the front on the third frame) and the lower break in the fibula (smaller bone, shown on the right in the first two frames and behind the tibia in the third frame). Mr. Kirchhofer likes to say that his tibia looks like a carrot that someone took to a cutting board, and no image shows that idea better than this one. Surgeons used an external orthopedic fixation to keep the leg immobile as the fractures healed. 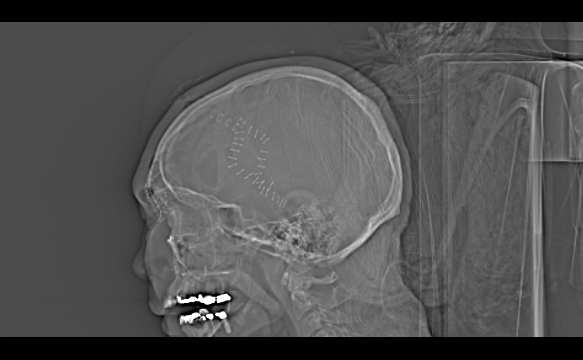 This x-ray shows the start of the external frame, which secures the pins and screws within. Eighteen days later than originally planned, Mr. Kirchhofer finally made it home, at least for a few hours. He made the trip over to check out the newly made changes to accommodate the newly acquired wheelchair he would be using. All the items he’d need regularly were now between two and four feet of the ground, levels he could access comfortably from his chair without straining himself to stretch too high or risking a fall by reaching too low. Rachel and Beth moved everything out of the way, shoving couches and chairs toward the walls. They also consolidated all their belongings in one of the two upstairs bedrooms, so that visiting guests could use the other. Mr. Kirchhofer’s mother and aunt made stockpiles of food, especially ones that would make a tasty puree, the only texture of food Mr. Kirchhofer’s broken upper jaw would allow. The biggest change, though, was Mr. Kirchhofer’s new sleeping arrangement — a reorganization of his room’s furniture that involved a hospital bed Rachel had ironically found a few months ago for $20 at Goodwill. Mr. Kirchhofer had teased her about the purchase when she brought it home, but now he can only appreciate the convenience it has given him; the electrical controls allow Mr. Kirchhofer to keep his leg elevated, but also to lean his upper body up when he needs to get up or bend over to dress his wound. Jan. 18, 2013, the day after his first visit, Mr. Kirchhofer came back home for good. His return has been “really awesome,” Katie said. Since he spent two weeks in Tennessee and then over another two weeks at University Hospital and Rusk Rehabilitation Center, Katie hadn’t seen her dad in a normal setting for over a month. Since Rachel helped with the preparations to the house, she was also nervous and scared about how “he would be able to do it all” when he got home. For her, his return meant his recovery was going better than expected, though, and she spent the entire day beaming. The best part, she said, is coming home everyday to see her dad, especially because she no longer gets to spend her days with him at school. His absence at RBHS, after she “knew he was OK,” is an aspect of life to which it has been hard to assimilate, Rachel said. Mr. Kirchhofer has even started going to school himself, in the form of videos prepared for the Advanced Placement chemistry class. Ms. Harman and substitute teacher Mr. Tyler McSparin had been preparing lessons for the class in his absence, but now the two AP classes are completing in-class and homework assignments selected by Mr. Kirchhofer. Mr. Kirchhofer’s honors classes have been following the plans of Mr. Barry Still and Mrs. Harman’s honors classes, as all three teachers generally collaborate to keep the honors chemistry experience the same. Mr. Kirchhofer hopes to return to the classroom by spring break, conveniently the same time Mr. McSparin plans to start substitute teaching for Ms. Harman during her maternity leave. Although the external apparatus and cast have been removed, an internal frame remains. 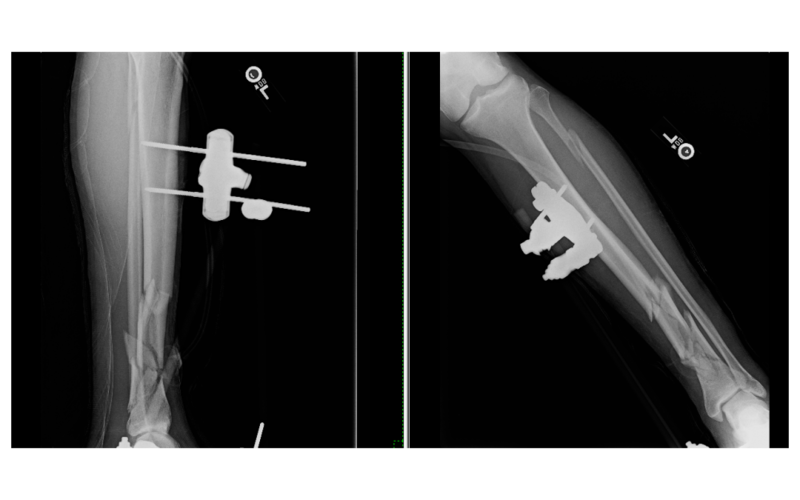 These x-rays show the process of surgeons using pins and screws to secure a metal frame to the tibia, which holds the broken parts together and allows them to heal. For now, though, Mr. Kirchhofer is focusing on his recovery. 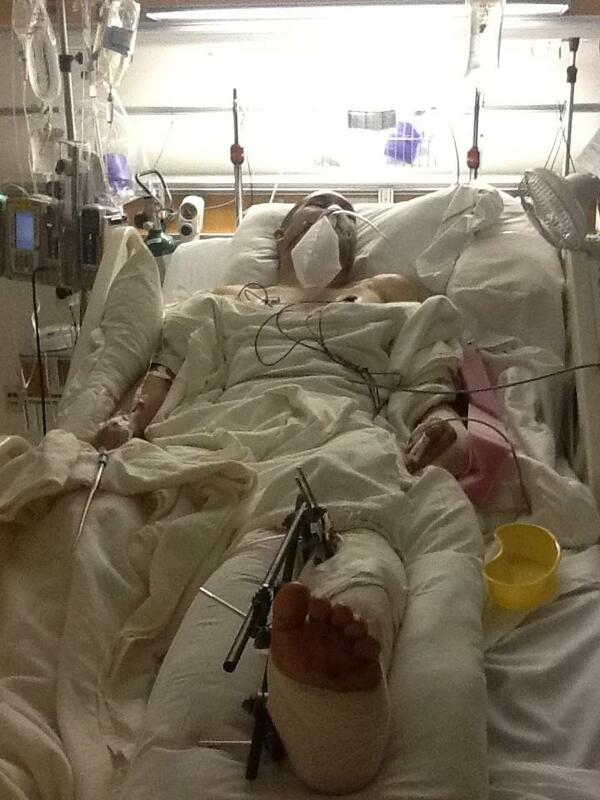 His leg and arm casts are off, and the open wounds on his left leg are healing better. Zeus knows to get out of the way of the wheelchair and nearly all the doors have been removed to allow smoother wheeling. Mr. Kirchhofer’s sight is improving; his right eye, the “good eye” is able to read, especially with his magnifying glass. Mr. Kirchhofer didn’t want to call his left eye the “bad eye,” even though he thinks it would be legally blind if tested, so instead he’s settled on “the good eye that’s done bad things.” Although he’s not entirely happy with the name, he hopes the eye will heal before he can come up with a better one. Mr. Kirchhofer laughs that he’s gotten a free facelift out of his facial surgeries. Still, his face seems distant and half-numb, as if the effects of novocaine are just starting to wear off. His nose feels crooked, and his sinuses are still stuffy and can barely smell. His face is still quite painful, he said, and the pain in his leg “goes back and forth.” He wears a shoe on his right foot, which gives him traction against the floor, and a sock or red slipper perched on his left foot, which keeps his exposed toes warm. With food, Mr. Kirchhofer is still on a liquid diet, which he calls, alternatingly, gruel, mush or baby food. Some meals, especially soups, are better at a flowing liquid texture that others. He’s found that he dislikes ground up dishes, like lasagna, that intentionally coordinate the careful union of many flavors meant to be enjoyed together. Mr. Kirchhofer has been eager to return to the kitchen himself, with his most notable and recent meals being a squash soup, his first post-accident creation, which he made when he was still at Rusk, and a ziti bake for the small dinner party celebrating Rachel’s sixteenth birthday. Although he offers tea to all his guests, working in the kitchen is still an arduous process, Mr. Kirchhofer said, as everything takes several times longer now than they did pre-accident. RBHS teachers have been helping with meals, signing up for days through a “SupportPlanner” called Caring Bridges, “an online calendar that helps family and friends coordinate care and organize helpful tasks” that Mrs. Trice set up. From those who would be unable to prepare a meal on a certain day, Mrs. Trice filled a laundry basket with a collection of pantry items, snacks for the kids and puree-able foods for Mr. Kirchhofer. Nearly all the activities and tasks on Caring Bridge have been taken for the next two months. 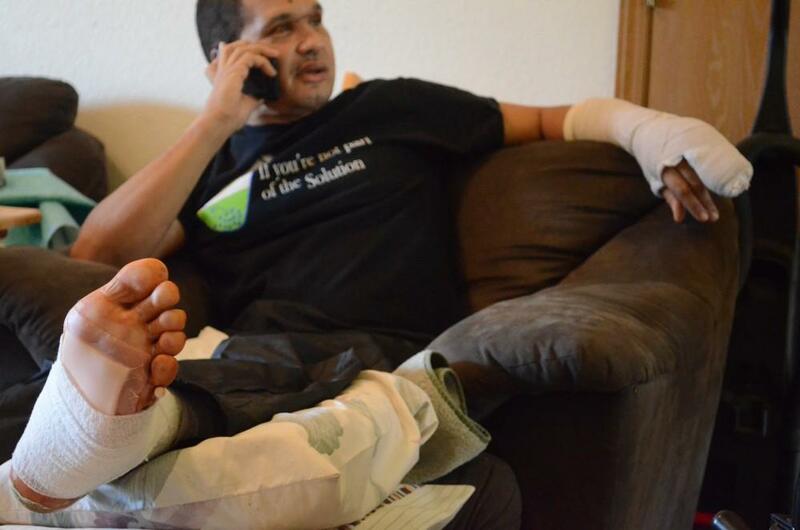 Even with all the healing, some of Mr. Kirchhofer’s injuries will need to be readdressed. His missing crown cannot be replaced until his jaw can take pressure again. His eyes can’t be tested until the swelling goes down. The bone work on his leg may need rebreaking and refixing, and the sinus work may similarly need reworking. Despite the extensive recovery process, Mr. Kirchhofer is thankful for the wounds that didn’t happen, particularly the spinal cord and brain injuries that so often seem to plague car accident victims. Mr. Kirchhofer said he feels “overwhelmed with gratitude” that the prognosis is “as good as it seems now.” However, even if he’d lost a limb or faced a future confined to the chair, he said being alive would be enough. If her dad’s future didn’t look as hopeful as it does now, it would still be OK, Rachel said. Knowing that her dad was alive made it possible for her “to at least try” and go through a normal school day. She wouldn’t know what she would do without him, she said, but Mr. Kirchhofer interrupted that she’d be just fine without him. “But,” he repeated, and they laughed a relieved sort of chuckle. If he had died, though, Mr. Kirchhofer is comforted knowing that the people he would have left behind already know how much he cares for them, he said. He’s had personal family loss in the past, he said, that left him feeling like he’d left words unspoken and actions incomplete. Father and Middle Daughter are sitting in their living room. Rachel walked over during her lunch break, and Mr. Kirchhofer is looking through his medicine box to see which pills he no longer needs to take. “This feels semi-normal,” Rachel said. This isn’t the ‘normal’ he’s ready to settle for yet, Mr. Kirchhofer said. 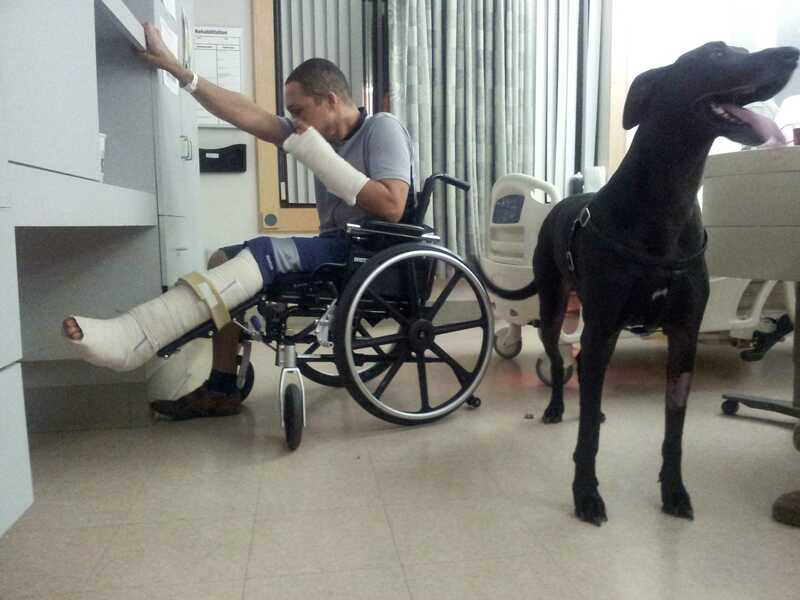 He wants to be able to get around without calling in all his favors for a small trip to the store. “Normal might end up being me driving you,” Rachel said, and Mr. Kirchhofer nodded in agreement. A friend gave Rachel a Hello Kitty license plate cover for her birthday, and she practice parallel parking last weekend in preparation for the driving test. Mr. Kirchhofer is anxious for his vision to improve enough that reading small print without his magnifying glass is less straining and time consuming. 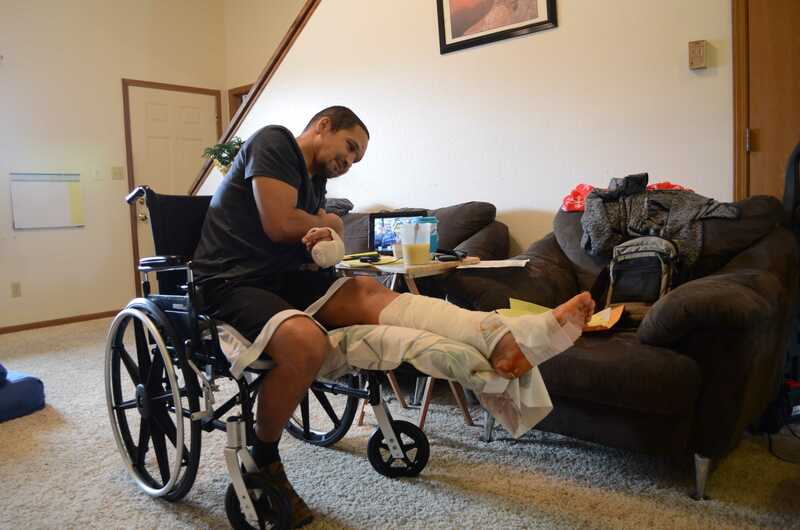 Though he is cleared to return to work as soon as he feels comfortable, Mr. Kirchhofer said this comfort will only come when he can wheel through crowds of people without being afraid that someone will bump into his leg. Right now, he’s nervous for even Zeus’ wagging tail to whack it. Mr. Kirchhofer anticipates returning to RBHS at least half-time before spring break and hopefully full time afterwards. It’ll be a process of experimentation and testing, though, because he wants to make sure he’s completely ready before he returns at all; he would hate to commit a full week of teaching, he said, only to realize by Wednesday how worn out he was. Positions: The Rock Editor in Chief, Web Interactivity Manager, Infographics Editor Contact: njagdagdorj@bearingnews.org Bio (By Abbie Powers): Nomin-Erdene Jagdadgorj is a girl of 17 well-honed years. Throughout the course of life thus far, Nomin has managed to stamp the world with a rich, sizable footprint. If one were to look closely into this intricate pattern of years, they would find many delectable experiences, a radiating sense of kindness, and an overall glow of a warm life lived. Nomin’s intellect shines in step with the shimmer in her fanciful, caramel eyes. Not only does she speak two tongues, but she does this fluently, the say way she performs many other desirable tasks, such as writing, thinking, and having multiple personas. Nomin’s thick black hair falls like an ever flowing velvet curtain against those rosy, oh-so-pinch-able cheeks. Her charm and marvelous spirit have led to the breakage of many hearts, the acquaintance of a few hearty enemies, and, most importantly, the love of an abundant herd of family and friends. Nomin resides in Columbia, Mo. with her father, mother and younger sisters. Thank you all for reading and commenting on the story! It was an honor to write about such an incredible and inspiring person. Nomin, thank you for writing this amazing, heart-wrenching article. I do hope that he recovers fully and will keep him in my prayers. Everyone is talking about this article (including my own mother). It’s an amazing article about an amazing man. This is a very well-written article, Nomin. Mr. K’s strength through it all is so amazing and inspiring. It is nice to be able to read about the family’s perspectives, and the overwhelming care is almost tangible. Can’t wait for Mr. K to come back! Absolutely beautiful and heartwrenching. You captured this perfectly, Nomin. I hope he gets well soon. 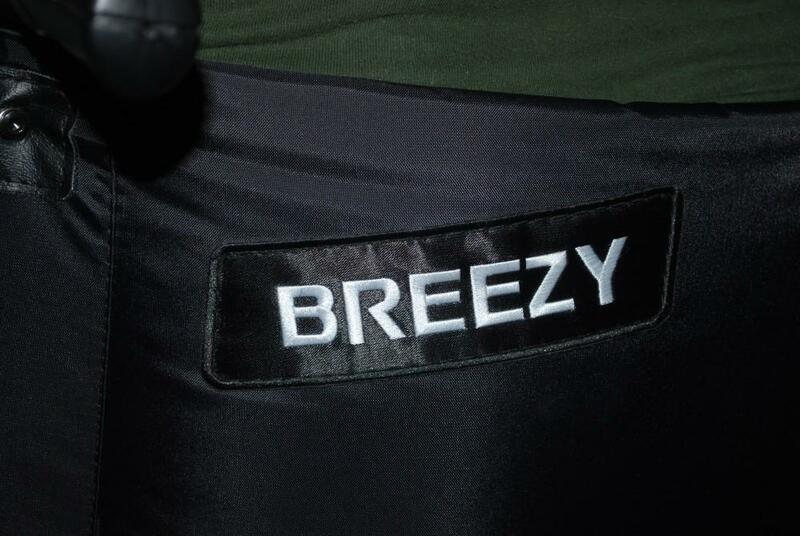 As a Mother, I am most grateful for the family and friends of Gregory that have showered him with prayer and love. We are blessed by Gregory’s response. Thank you, Nomin-Erdene, for a phenomenal, journalistic endeavor. I’ve spent the last 45 minutes reading through all of this and watching the videos and listening to the podcasts. I cried. Thank you so much, Nomin, for your work on this story. It is really inspiring. I know I, for one, can’t wait for Mr. K to be back with us in AP Chem and am grateful for his recovery thus far. Alyssa, I’m so honored you took the time to read and listen and watch everything, and I’m so happy you liked it.